How safe is your home computer and home network? If you can’t answer that, you are probably not protected. Typically when you purchase a computer you will get a free trial or even an entire program, such as Windows Essentials with your purchase. Many people think this is sufficient protection against malicious files that will corrupt your computer. However, this is a common misconception. Would you leave your wallet out in the open for a passersby to take what they want? Failing to properly protect your computer and your home network is no different than this. While you may be the best in your profession, you must consider that those out to attack your computer security are the best in their field. For this reason, choosing the very best internet security is imperative to the health of your computer, as well as your checkbook. It isn’t only your bills that you have to worry about, either. Think of all the sensitive information contained in emails and personal documents you hold on your computer. Sure, you can get yourself a cloud account and store information there, but with all the options out there do you really want your information stored in a cloud account that has not passed rigorous scrutiny. Nobody wants to deal with the problem of having your computer attacked and your files corrupted. These worries are legitimate and very important to the security of your network and your life. While some people shy away from online bill paying and online banking altogether, the majority of us utilize these capabilities to quickly pay our bills and check our balances daily. This means there is an increasing need for internet security as the computer age will only progress further as we go into the future. In fact, some places only provide the option to pay online. While Windows Essentials provides security against the blacklisted files that are detected and could harm your computer, this is simply not enough. More secure options such as Symantec and Kaspersky offer a bit more security with added features like whitelist files that are deemed safe for your operating system. Not only does this make your network a safer place to be, the added feature of behavior analysis, or heuristics, gives you the added security of identifying known threats that could cause problems for you and your computer files. Many of us have home networks with many devices attached, from laptops to smartphones. A compromise of one could compromise them all. That is why you should have a complete security solution that includes not only robust Windows 8 antivirus protection but a personal firewall and other security features. 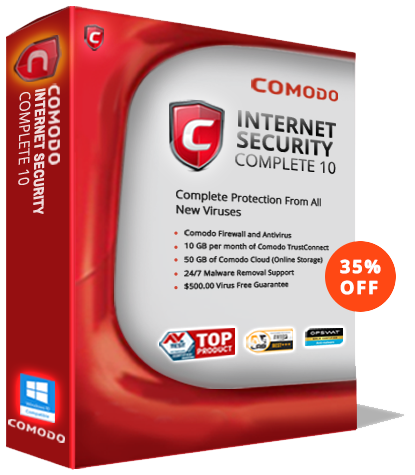 When you compare all of the available antivirus software available, Comodo Internet Security’s unique Default Deny architecture with autosandboxing ensures that files that are not safe are never allowed to run on your operating system. The worst thing that can happen with malware is it runs in an isolate, secure system area called a sandbox. Inside the sandbox, no harm can come to your system or your files.